During my first visit to the Florida Keys in 2015, I left five pieces out on the streets. As detailed in my previous post, for the commemoration of my 100th “Relationship” collage, I made a series of 10 (+1 artist’s proof) collaged book pages. This piece (Relationship C) was left on 11/22/15 in Key West, Florida. 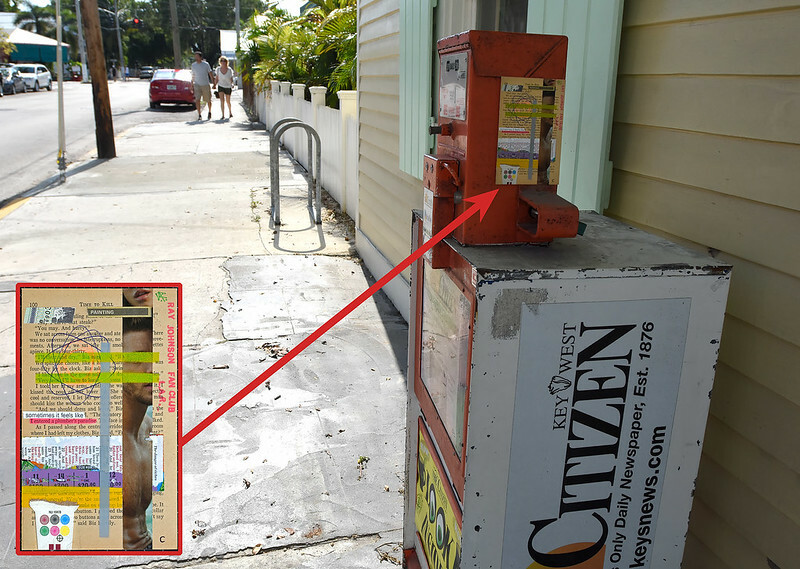 I stuck it on a Key West Citizen Newspaper box beside the (closed) Backspace Bar & Kitchen at the intersection of James St. and Grinnell St. Relationship C – “TIME TO KILL PAINTING” left on 11/22/15 in Key West. RJFC Sticker # 59 was completed in Clearwater, Florida around 11/3/15, using found trash on a CD label. It was left on 11/22/15, on the outside of a purple magazine distribution box for Key West Maps & Coupons, just beside the famous Schooner Western Union, in the Key West Bight Marina at the end of William Street. 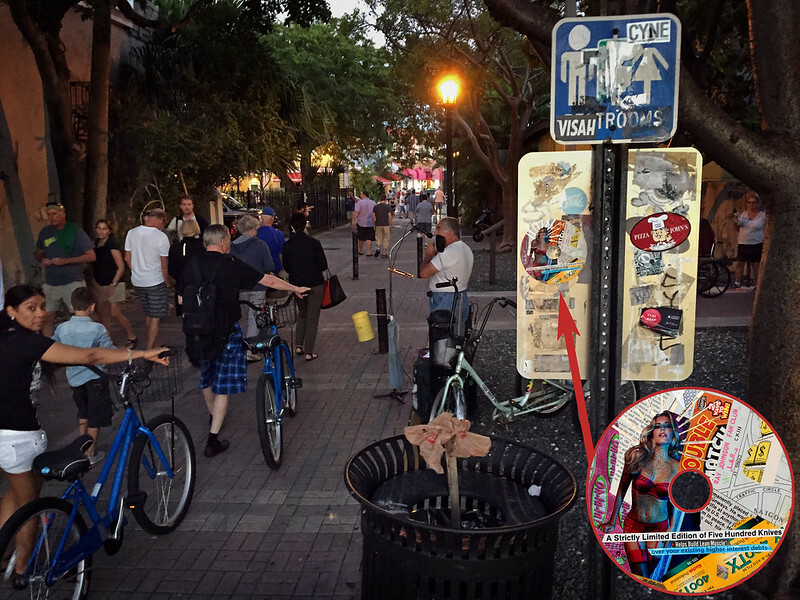 RJFC Sticker # 59 – left in Key West. Stickers No. 60 & 61 were completed on 11/19/15 while sitting at a Panera restaurant at Clearwater Mall. These rectangular stickers all measure about 45mm x 118mm each. 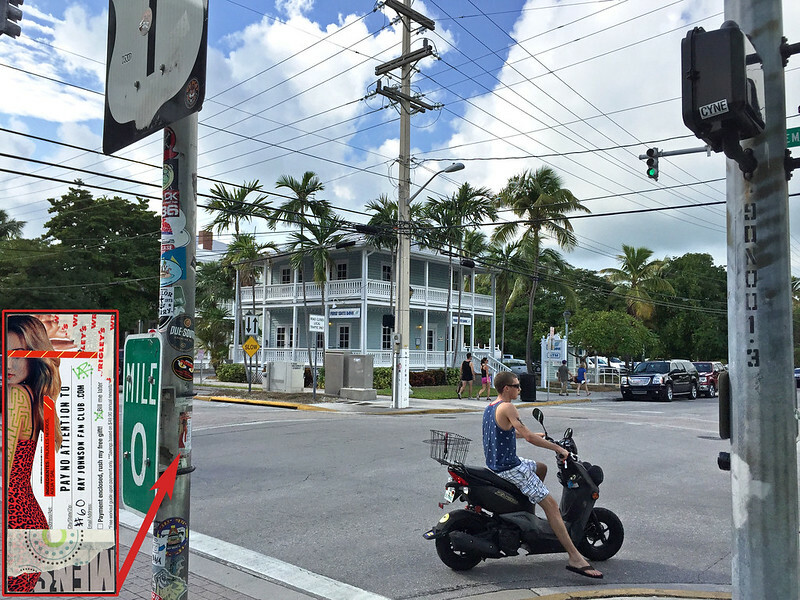 Sticker # 60 was left on the signpost for Mile 0 of US Highway 1 in Key West on 11/22/15. 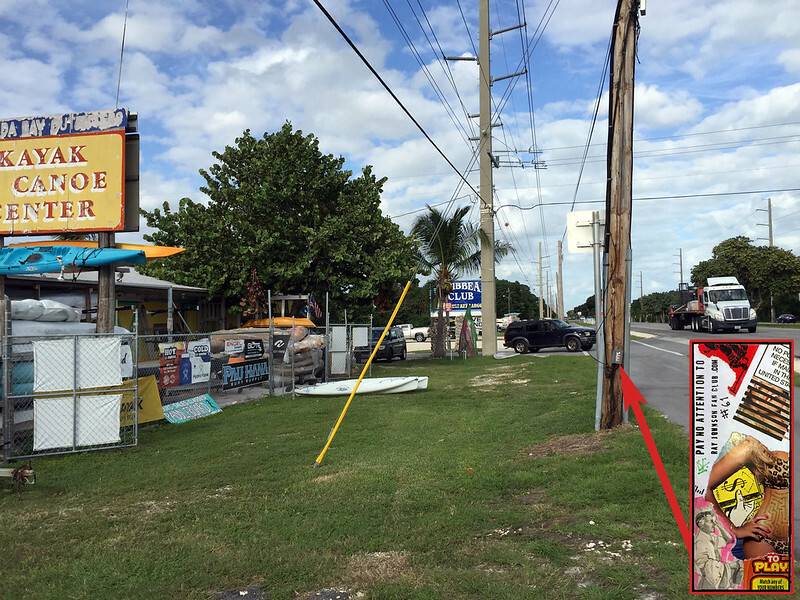 Sticker # 61 was left on a telephone pole in front of Florida Bay Outfitters, beside Jimmy Johnson’s Big Chill Restaurant and Bar (where we had lunch) on US Highway 1 in Key Largo on 11/24/15. RJFC Relationship CXIII ~ “A Strictly Limited Edition of Five Hundred Knives Helps Build Lean Muscle over your existing higher interest debts” was made with found trash on a 45 record. It was also completed on 11/19/15 while sitting at a Panera restaurant at Clearwater Mall. RJFC Relationship CXIII was left on the back of a sign while exiting Mallory Square toward Tifts Alley in Key West on 11/23/15. This 82nd “Relationship” collage was completed 5/15/2014 in my home studio (Mons, Belgium). This is my first piece made experimenting with “wood block” printing of lines and shapes. 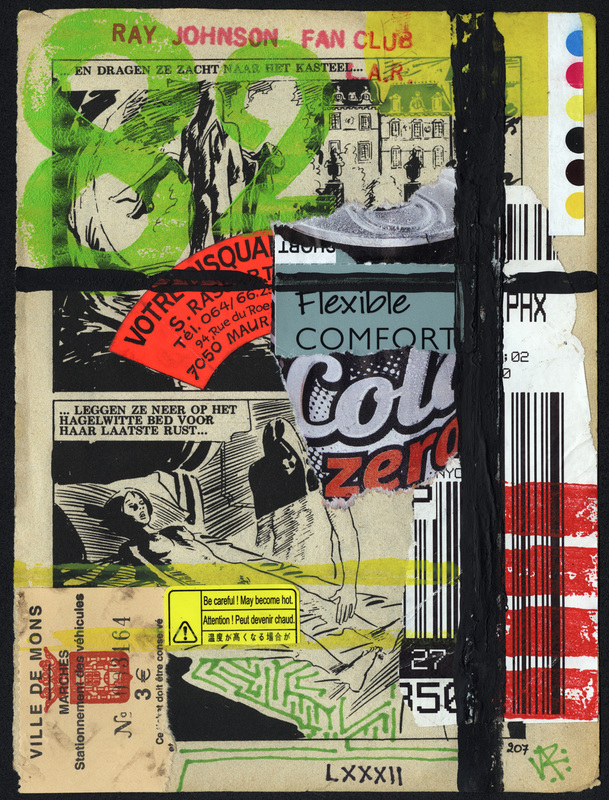 For quite a while now I’ve been toying around with the idea of making several series of collages on the pages of old books or comic books. This one is from “page 207” of some random Flemish sexploitation/horror comic. The large green numbers are a continuation of my work with wooden printers blocks. I really think this is part of the necessary transitional stage toward a good direction for my collage work. I need to find a better method for using the wood to print lines and shapes. The colored paints stick to the paper making it difficult to pull away. For my “blocks” I’m just really using random wooden things from around the house, like the side of a fruit crate for the black lines, a chopstick for the thin yellow lines, and the back of a number block for the 4 red rectangles. This piece is currently available.